Hey readers! 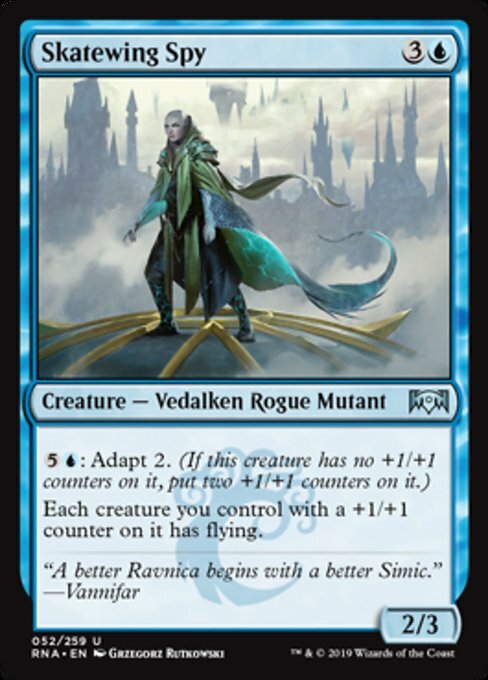 I am super stoked to be writing the Simic review for Ravnica Allegiance! If I had to pick a single guild that best represents me as a person, it’s most deifnitely the Simic Combine, full of aquatic organisms, a desire to explore and experiment, and do weird shenanigans. As an evolutionary marine biologist, I am excited for Simic’s new, very thematic ability: Adapt. This plays similarly to the Monstrous ability in Theros, but with the potential to reactivate it if the counters are moved or removed, which is great for decks that use those counters as a resource. 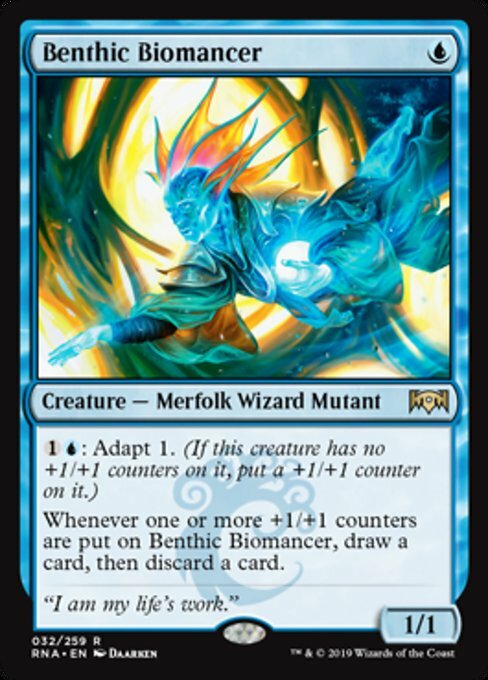 Now the Simic are… Merfolk? Elves? Oozes? Mutants? Whatever they are, they are creatures of science! Therefore we shall present this like a scientific paper! You have read the introduction, the cards given to us will be our data, or results, we will have a discussion for each data entries, and a final conclusion evaluating our findings. Let’s begin our results and discussion section with this round’s commanders, followed by the rares, and ending with the EDH-relevant uncommons and commons. Without further ado, so let’s dive on into what this set has to offer for all of us glorious Simic players! Be ready, because Simic got the most toys out of any guild, so it’s going to be a long one. Drawing a card upon entering the battlefield is not terrible on a 4/4 body for four mana. She definitely isn’t the best Merfolk commander we’ve received, but she’s not awful. In fact, her final ability is reminiscent of Herald of Secret Streams. 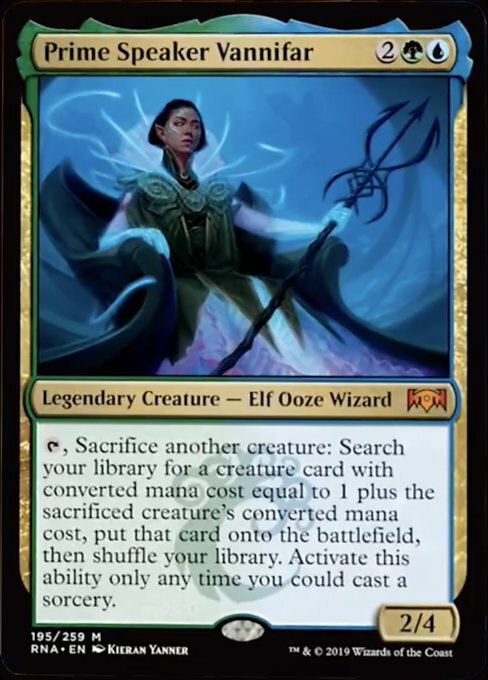 I can’t see her being a terribly overwhelming commander, particularly when she’s competing with the best of the best +1/+1 counter commanders like Ezuri, Claw of Progress, Atraxa, Praetors’ Voice, and Experiment Kraj, to name a few. However, her ability can definitely fit into several supporting roles. She will find herself very comfortable in all of the aforementioned commanders as a way to give your creatures trample, and it’s nice that she can power herself up as well if you have the extra mana. 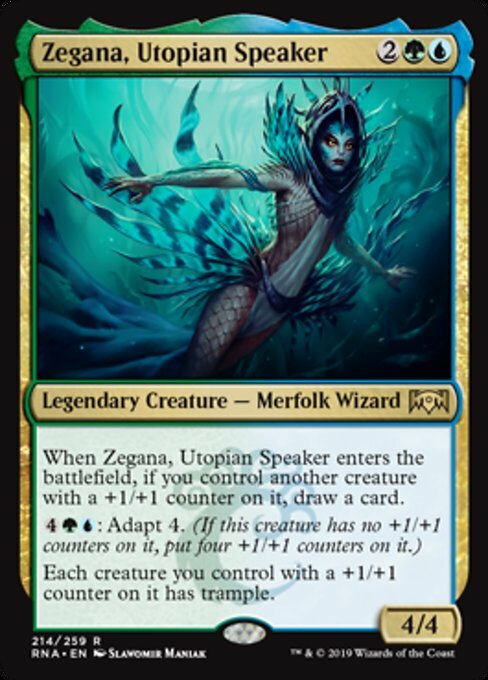 Personally, I am excited to fit her into Kumena, Tyrant of Orazca as another way to buff my Merfolk and creating a win condition. An inclusion for the 99, rather than the command zone. Now this is an overwhelming card. Let’s take a moment to appreciate her aesthetics first. 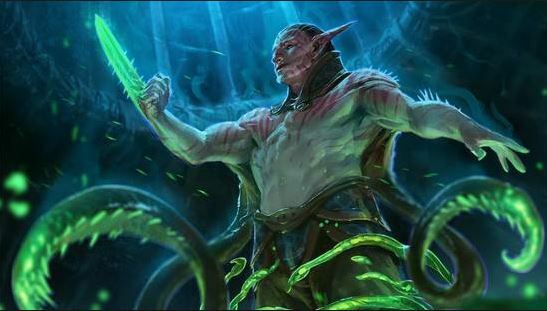 The new replacement for Zegana as the Prime Speaker of the Simic Combine features another gorgeous piece of art done by Kieran Yanner, and the creature type of ‘Elf Ooze Wizard’ just makes me so happy. However, everyone really wants to talk about how this creature is just Birthing Pod in the command zone. Many have discussed the different toolboxes or combos she will enable, (Intruder Alarm has recently spiked in price for precisely this reason) but I think it’s important to discuss how she’ll be seen politically. Unfortunately, there’s a general consensus that no matter how you build her, she will probably succumb to the same issues that any overly competitive commander has: she will be hated off the table immediately. She’s so close to assembling an infinite combo by accident that it may just not be worth the risk for the rest of the table. I expect many shenanigans from Vannifar, in a similar vein to those exemplified by exemplified by Yisan, the Wanderer Bard. This is an engine that’s very easy to piece together. I personally would build her very casually, just trying to capitalize on random ETB effects rather than setting up an instant win, but everyone has their own preferences, just make sure to communicate well with your playgroup! 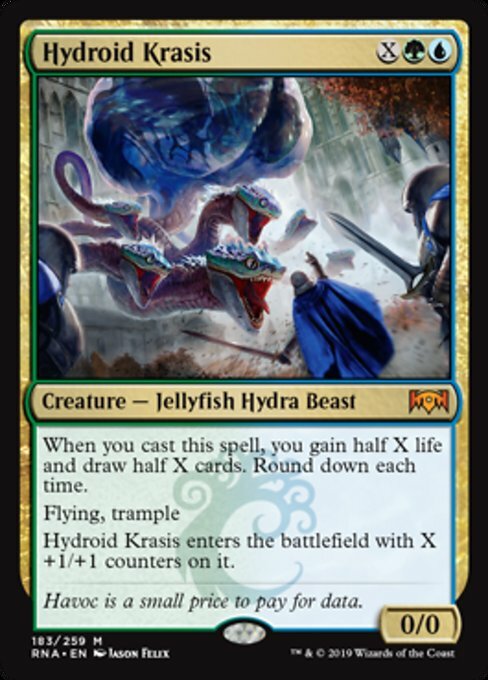 In my personal opinion, Hydroid Krasis could have the same exact cost, without the on-cast ability – just flying, trample, +1/+1 counters – and it would still be a rare powerhouse in any format. That trample is a big upgrade from Nimbus Swimmer. 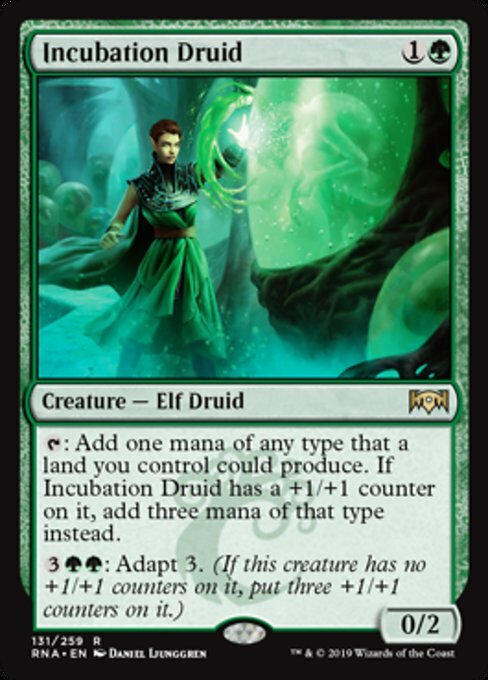 I think it would see a lot of play in any deck that likes big mana, such as Kruphix, God of Horizons, or any deck using +1/+1 counters, like Vorel of the Hull Clade. However, it’s more than just a creature, it also draws you cards! Without even needing to hit the battlefield, so you’ll still draw them even if it gets countered! That’s just icing on the cake, and it very deservingly pushes this card up to mythic status. In Commander, the lifegain will likely be insignificant, though it could occasionally help make a difference. It’s the card draw that really seals the deal, though. I expect to see this explode in popularity among all decks containing its colors as a solid endgame beater. This guy is definitely more of a player in 60-card formats than in Commander. One-drops like this probably aren’t going to make a huge difference, but he will definitely find a few niche areas he fits well into, and I think he will be played in a lot of decks where he is sub-optimal. For example, I can see him paying off well with Atraxa’s Proliferate ability, where he can loot cards at the end of each of your turns. However, I think people will play him in decks like Ezuri, Claw of Progress, where he’ll be expected to be a good performer, but his ability doesn’t work as well when receiving multiple counters all at once. 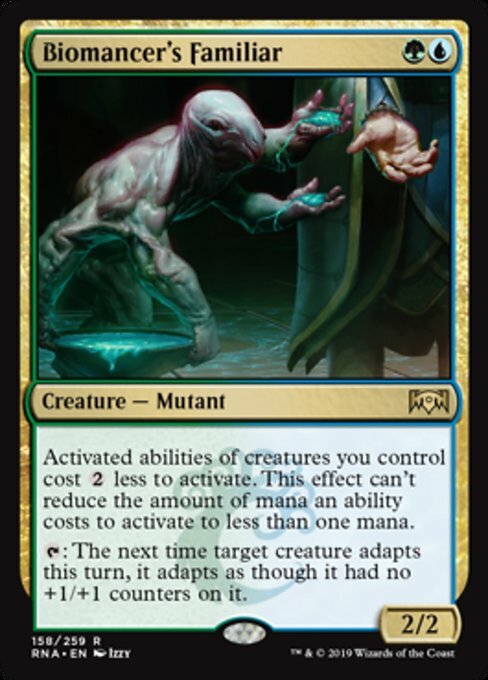 I think he will fit very well into Merfolk tribal lists like Kumena, Tyrant of Orzaca, where he can incrementally get lots of triggers from Kumena’s ability. In a deck where his creature type, cheap mana cost, and looting ability are all extremely relevant, he’d fit well there even without the Adapt ability. I honestly never thought I would see the likes of Training Grounds again. Reducing the cost of your abilities by two mana is absurd, especially if you can get both Biomancer’s Familiar and Training Grounds on the field. This will fit very well into pretty much any deck that capitalizes on heavy-mana-cost abilities, such as Experiment Kraj and all its minions. Definitely consult the Training Grounds EDHREC page to find the Familiar a suitable home. The second ability is unlikely to be relevant to EDH. 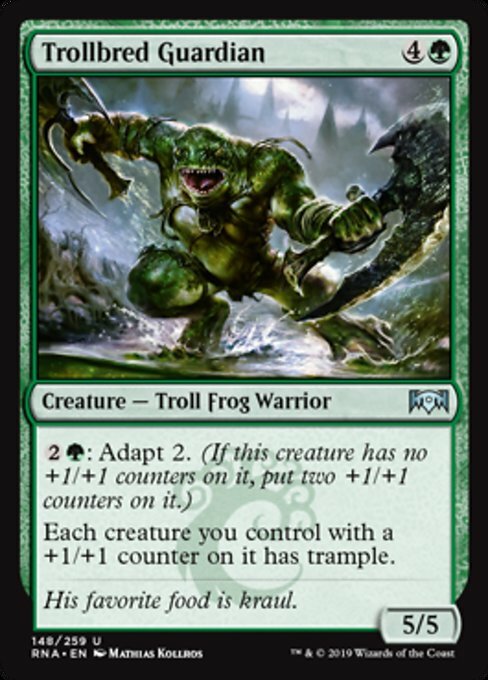 It’s interesting the way it’s worded, because Adapt can actually be activated even if a creature does have +1/+1 counters… it just won’t do anything. With this guy, Adapt becomes stronger and reusable, but honestly, that’s still pretty negligible. Most of the Adapt creatures probably won’t find much play in EDH, so this is just a side ability tacked onto an already really abusable and versatile card. 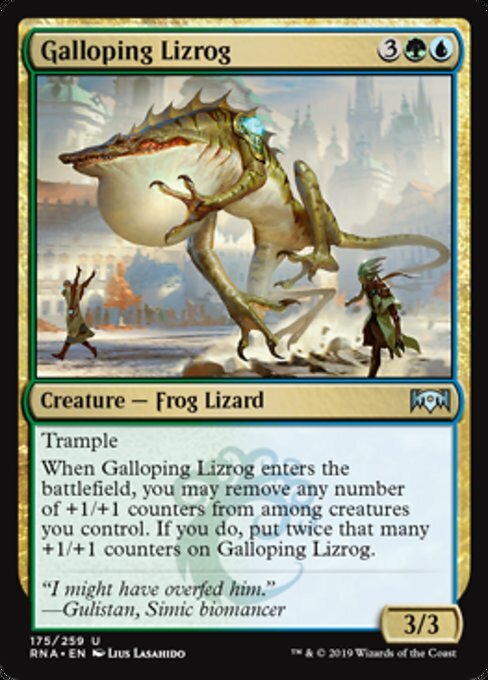 This will definitely see a lot of action in Standard with creatures whose ability costs it can reduce, and it will see play in EDH for exactly the same reasons. This is a good mana dork… in the right context. For one mana more than an Elvish Mystic, you get to make mana of any type your lands could produce. (Note that it says “type,” not just “color,” in case you’re using any colorless mana Eldrazi effects.) We’ve seen stuff like this on other mana dorks, and it certainly isn’t a Bird of Paradise, but if you can reliably put a counter on her early in the game, it can turn into a Gilded Lotus. I think this creature’s versatility and usefulness is going to be found in situations where she can get the +1/+1 counter before you would need to use her Adapt ability, like with Ezuri, Claw of Progress or Mazirek, Kraul Death Priest. 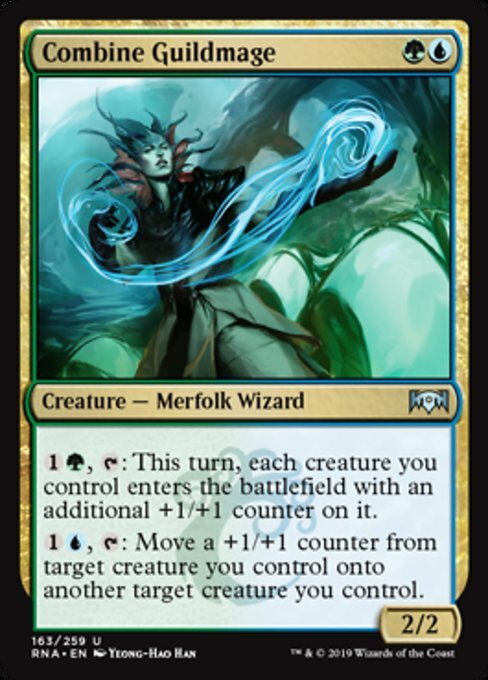 In fact, she will probably be best used in non-Simic decks with cheaper commanders that can put those counters on early. This is an absurd win condition. It gets growth counters for each +1/+1 counter, not just each instance! Even without the activated ability to enable it, this could be an auto-include in almost any deck with counters. Have 10 creatures with +1/+1 counters in Atraxa, Praetors’ Voice? Proliferate just twice and you win. 5 experience counters with Ezuri, Claw of Progress? Throw in a Doubling Season, slap 10 counters on a creature, 20 on the enchantment, and you’ll win as long as you make it to your next upkeep. Heck, even a lone Forgotten Ancient could probably win with this card in just a few rounds. 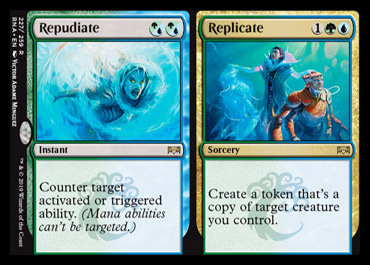 This is a reliable alternate win condition for Kumena, Tyrant of Orazca decks too, which have tons of ways to untap their Merfolk multiple times per turn. And can you imagine it with Pir, Imaginative Rascal and Toothy, Imaginary Friend? Or Vorel of the Hull Clade!? Just make sure you hold a Counterspell in your hand to protect this enchantment, because people aren’t going to just sit idly by while you speed toward victory. This card is a new Simic staple, but everyone will also hate it. I really like this card. It’s versatile, affordable, and mana flexible. While Stifle is only one mana, I think it’s worth one more for some color flexibility and its attachment to a Cackling Counterpart. Three mana to clone any creature you control can be extremely significant. Whether that just fast forwards your engine, ramps you, or gives you another heavy beater, I think this is worth the cost. Incongruity is definitely the better half of this card. It’s a creature-specific Beast Within that gets around indestructibility and prevents those obnoxious reanimator decks from getting their stuff back. It would be an excellent removal spell even without the other half. 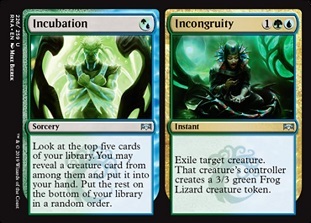 The Incubation half is useful if you are really struggling for creatures and need to pull one out of your deck fast, especially considering its color flexibility and super-cheap cost. However, I think that in almost every scenario, you would rather exile a good creature with Incongruity than try to dig for one with Incubation. Combine Guildmage is a worse Master Biomancer and slightly buffed Oran-Rief, the Vastwood. Your creatures entering play with an additional +1/+1 counter is nothing to laugh at, and can turn vulnerable creatures into threats that are just that much harder to handle, especially if you can capitalize with lots of creatures you control. Her second ability seems primarily useful when fiddled around with Evolve and Adapt, but will probably be less notable in Commander than 60-card formats. Overall, a good budget addition to Simic decks. They finally did it. A Lizard Wizard. WotC has listened to its people and given back to us. I think Mystic Snake is better because it has a less restrictive mana cost, though some players may be of the opinion that the additional green symbol is worth an additional point in power. 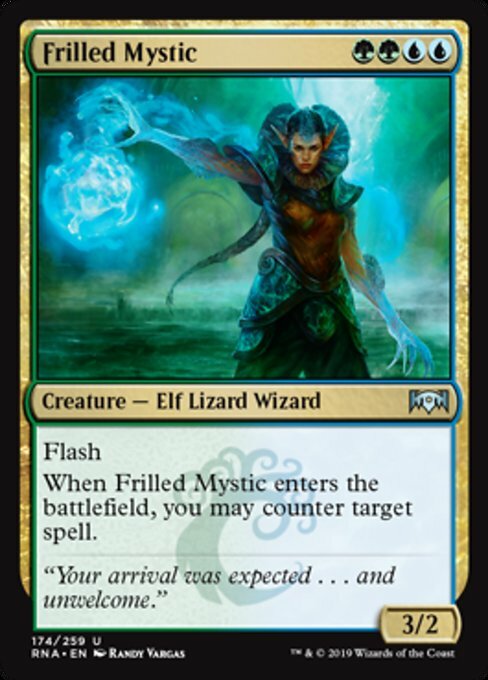 However, unless Elves matter more in your deck, or you just really want to be able to say, “I cast my Lizard Wizard to fizzle your Sizzle,” you’re probably better off with Mystic Snake. This card has a pseudo-Mycoloth feeling to it. I personally would probably never play it because I don’t like to put all my eggs in one basket, and removing that many counters to pump him up is just asking for targeted removal. However, it can become a solid beater, with trample no less, and if you can reliably protect him, it may fit in to some counter-themed decks. This is a good budget option for the endgame. 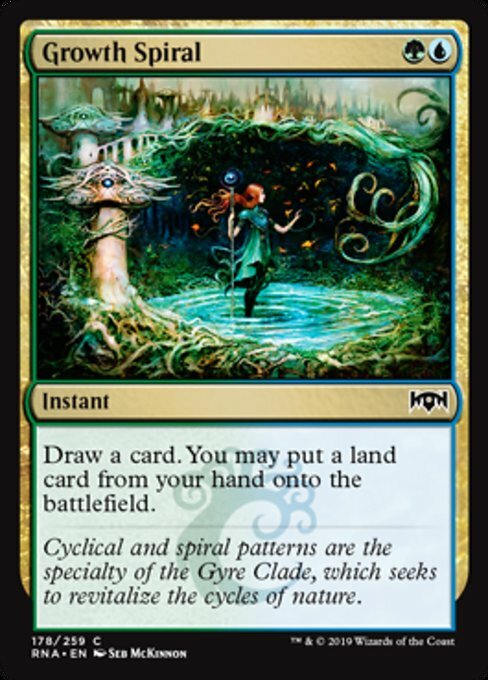 It’s a Simic Explore. By adding blue, you get an instant instead of a sorcery. Whether you play this over (or in addition to ) Explore is up to you, but the interactions at instant aren’t bad, especially since they let you hold up counterspells more easily. Could be fun to flash in an unexpected Maze of Ith, too. Still, it probably is more of a big deal in Standard than EDH. Both of these are simple. They give your +1/+1 creatures trample or flying. It’s Helium Squirter and Zegana, Utopian Speaker. Useful in more casual and budget decks, but better options in more tuned decks. I am very excited for this year’s contributions to the Simic Combine. We are off to a great start, and we have been given so many options, including many more blue and green cards in the upcoming Guildless set reviews! I can’t wait to see the bonkers shenanigans people begin to play with after brewing. Do you think any of these cards are sleepers and will be more powerful than I am giving them credit? Are there any you think were overestimated? What decks do you think are going to see the most play with these new cards? Let me know in the comments below!